We’d love your help. Let us know what’s wrong with this preview of Too Busy to Be Happy by Christine Laperriere. What do you do when you can't handle the life you've created and you feel you don't have time to catch up? From the outside, your life looks successful. But inside you're overwhelmed and exhausted. ¬ The harder you try to juggle it all, the more burned out you feel, and your attempts to keep up are not working. Everyone has a finite amount of emotional real estate to proces What do you do when you can't handle the life you've created and you feel you don't have time to catch up? From the outside, your life looks successful. But inside you're overwhelmed and exhausted. ¬ The harder you try to juggle it all, the more burned out you feel, and your attempts to keep up are not working. Everyone has a finite amount of emotional real estate to process decisions, change, drama, baggage, and relationships. 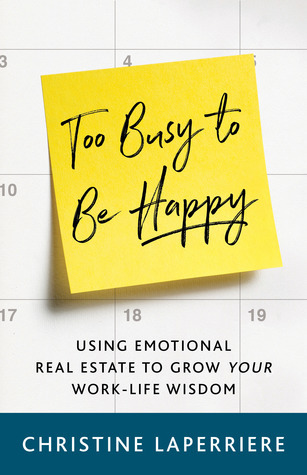 Too Busy to Be Happy reveals how you can make conscious choices about what you allow to occupy it, and how to defend those choices against the inherent impulse to do it all. With eight practices for dealing with the challenges you encounter every day, Christine Laperriere shares her personal story and teaches you how to reclaim and boost your energy and work-life wisdom. To ask other readers questions about Too Busy to Be Happy, please sign up.